The Trophy of the fourth edition of Pakistan Super League was revoked. The trophy ceremony of the fourth edition of the Pakistan Super League, the captains and guests of all teams, also brought pictures with the trophy. 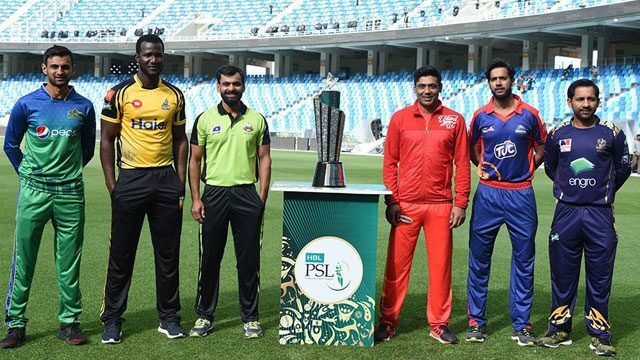 The regular launch of PSL4 will be held on February 14 in Dubai between the defense champions Islamabad United and Lahore Qalandars, for which all the preparations were completed. Captains of all the teams involved in the event press conference with Chairman PCB Ehsan Mani and Managing Director Waseem Khan. On this occasion, Ehsan Mani said that the tour of Pakistan Super League has been so far excellent, the franchise overwriters, sponsors and most of the players played in the event of success. He said that Pakistan Super League has become the national pride in 3 years, the purpose of this league is to give young players the opportunity to show their talent, PSL Trophy is reflected in the future with Pakistan’s culture and traditions.